Aikido originated in Japan. Japanese tradition, language, and culture influences everything about the art – the names of techniques, the design of the dojo, the way we address each other, etiquette and attire, even the relationships between junior and senior students, and our teachers. At the dojo you will hear a lot of Japanese words used – for the names of techniques, weapons, and parts of the dojo. We also use a few traditional Japanese words when addressing each other. You do not need to speak Japanese to train in Aikido, and you’ll find you can pick up the words we do use pretty quickly. In Japanese martial arts, rei-gi [RAY-ghee], or etiquette, is an important component of the practice. You will find most dojo observe somewhat different standards of behavior than you’d normally see in the outside world. Some customary manners in the dojo come from budo [BOO-doh], or martial tradition. Dropping down to sit on the floor in seiza [SAY-zuh], on our knees, is done left-knee first, and rising is done right-knee first. These conventions, similar to mounting a horse from the left side, were necessary when wearing a sword on the left hip. We can’t draw our sword easily (or safely) if we have our left knee up, blocking it. On the surface, these may seem like just prescribed actions – things we do because we’re expected to. But on a deeper level they indicate thoughtful, deliberate respect and commitment. In some cases, such as bowing, the action gives us a moment to settle and consider what we are about to do. For instance, bowing on entering the dojo not only demonstrates respect for the place and the community, but also indicates that we are entering a space, physically and mentally, separate from our day-to-day life outside. Here in Southern California, we generally tend to be rather egalitarian. Everyone addresses everyone else by first name. People wear casual clothing almost anywhere. Social status can be subtle, and people aren’t automatically afforded more respect – actual or demonstrated – just because of wealth or seniority. We’re pretty relaxed. But in the dojo, things are a bit more formal. We are less rigid than some dojo, but even so, hierarchy is something people are conscious of. We address our teacher as “Sensei,” never “Hey Dave!” We defer to students of higher rank, and would not dream of questioning or correcting them outright, especially in front of others. However, like in Japanese culture, all people are respected, and not judged to be greater or lesser just because of position. Other cultural aspects carry over as well. Classes begin and end on time. We all help maintain the dojo – it’s not something we leave for “someone else” to take care of. When in doubt, err on the side of being too formal. Sincere demonstrations of respect go a long way. Words: Huh? What’s Everyone Saying? Everyone’s first few days (weeks? months?) of training can be disorienting and overwhelming. You need to learn how to dress yourself, how to sit, how to stand… Acck! You also hear a lot of new words – Japanese terms and phrases. When I was hearing them for the first few times I couldn’t even make sense of them enough to remember them so I could look them up later. Here’s a huge tip: Almost every dojo, including ours, has a list of common terms in the dojo handbook! Be sure to look there – it’s very handy. 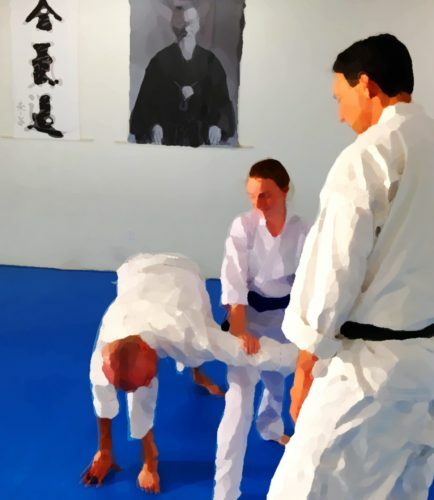 Ours can be downloaded as a PDF from the Membership page of the Aikido of San Diego website. You will hear and say this at the beginning of class, when Sensei and the class all bow to each other, and when you approach another student to ask them to train with you (you both say it). I’ve heard several interpretations of it. Whatever the exact translation, in practice it is a polite request which functions as “would you please train with me?" Domo is an polite, formal intensifier, like adding “very much” in English, except it comes first (like muchos grácias in Spanish). Gozaimashita places the thanking in time, relative to the action. Roughly it’s used like, “for something you’ve already done.” Here you are thanking someone for having just trained with you. You may have also heard “gozaimasu” [go-ZAH-ee-mahs, silent “u”]. That’s used when thanking someone for something they haven’t done yet. Like “Would you pick up some milk at the store? Thanks!” It’s also used for something that was just done, sometimes, so you will hear people saying it at the end of class, too. Several people have asked me recently about some of the words we use at the dojo. I’ve sent them some info privately, but what the heck, I might as well share with everyone. These posts will be as accurate as I can make them, but will all be informally based on my own very limited understanding. I will try to give some indication of how sure I am of what I’m saying, and if I’m just plain wrong please tell me so (and if appropriate I’ll go back and correct things). Any pronunciation tips I give will only be for how I’ve heard them spoken in the context of training, not The Correct Japanese Pronunciation. In no case should anything in these posts be considered authoritative. I do hope it will be helpful, though! When I know of solid sources of information I will point those out. There are a few very good books, websites, and podcasts, both for learning Aikido-specific terminology, and for learning to speak Japanese. I will tag each of these posts Words so you can click that tag after each post to see more posts about words. You can also go directly to a page here that will catalog all my posts about Aikido terminology.